Iron Cross is a new WW2 game from Great Escape Games. The idea is to put on big, rules-lite (possibly multiplayer) game and get it done in an evening. It’s a rule set that seems designed for club night play, where you want to have a load of people involved and use rules that can be picked up quickly. It’s worth pointing out before reading this review that the designers had a very specific aim in mind when designing the game: to simulate the clash between tanks and men at the company level. In order to do this they’ve stripped the rules to the bones. That means a lot of the stuff you might expect to see in a WW2 game isn’t there. If you’ve got the time to have a listen to the interview on Meeples and Miniatures then I highly recommend it to see where they’re coming from. Iron Cross is all about putting your toys on the table. Lists are very permissive. Transport is useful and very cheap if you’re using points. Have they left out too much? How good is what they’ve left in? Read on to find out…or better yet blow a whole £12 incl P&P on the rulebook, slap your toys on the table and try it for yourself! Speaking of the rulebook, you get a 32-page glossy book with a decent amount of relevant diagrams and some photos of miniatures on the table. These show a mix of 15mm and 28mm and are nicely shot but some are let down quite badly by using 4Ground buildings straight out of the box. I reckon if you’re going to go to include show-off pics in your book you should use terrain that’s above the bare minimum standard of presentation. Unpainted cookie-cutter 4Ground buildings complete with dodgy corner joins and laser burn marks on them don’t do it for me . 4Ground even sell the matching paints on their site and tell you which ones you need so you can do the necessary touchups after assembly. Putting them on the table as they come is the terrain equivalent of just doing your miniatures in block colours with no highlight and shadow IMO[/rant]. Apart from that it’s a very nice book. Normally I’d be annoyed by the lack of an index, but these rules are so short the table of contents is all you need. The book includes a points system and lists for late war forces, so it’s likely this is what most folks will use. Apart from that, you can choose whatever you like. The authors themselves like to play scenarios without using points, so they haven’t bothered to provide a finely tuned army composition system. This is probably both a good and bad thing, depending on who’s playing. In the hands of a minmaxing dweeb this is going to cause some tragic armies to be fielded, but I like to think the majority of people are sensible enough for it not to be a problem. It does mean the ruleset is more likely to see use for tournament play, although it’ll probably need extra restrictions on top. US, British, German and Soviet lists are in the book, but they’re pretty sparse. There are no engineers, and the rules contain nothing about combat engineering in general. Obstacles are only briefly covered, in that they slow or block movement. There’s no way to breach them. Minefields are not covered, but presumably these would be impassable terrain. The problem with this is that there aren’t any points values included for field defences. In some scenarios it’s implied that the defender can dig in their entire force, but to what extent should they be able to reinforce their positions? Who knows. Field defences are hugely important in WW2 games, especially as they get bigger, which the authors continually encourage throughout the book. I’m surprised they aren’t given a bit better treatment. Recce vehicles are covered, and have special rules allowing them to cross terrain and react easier (ie: get out of the way before being shot) but they’re actually no better at spotting hidden units than any other vehicle so their only real job is actually fighting enemy troops. That’s probably fine for many wargamers, but a missed opportunity IMO. Infantry guns are covered in the rules, but aren’t actually on the lists so you’ll have to take a guess at their firepower values and points cost. This is the guts of Iron Cross. There is no turn sequence as such, players have a pool of activation tokens, and the player with the initiative can place one on a unit and activate it immediately. The first activation within a turn is free, or you can try and reactivate a unit on a dice roll. The non-active player can also attempt to react before the activation happens by spending a token and rolling a 3+. This is affected by morale; units will become harder to activate (and less likely to react) once they’re suppressed. I like the way this bundles morale, suppression and the limitation of command resources into one mechanic. For example: A player activates a T-34 to advance across some open ground. This is its first activation this turn so is automatically successful. 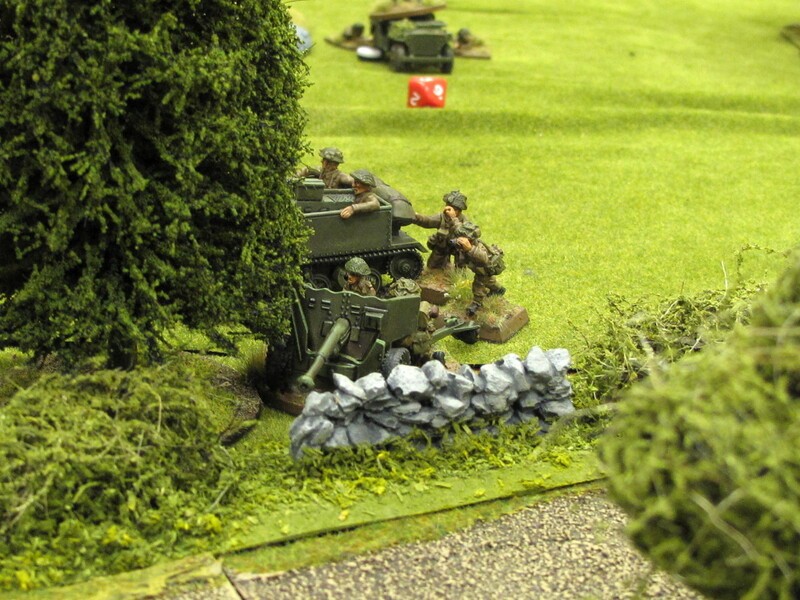 The German player reacts by firing a Pak-40, hitting the tank and inflicting one morale marker, but not knocking it out. The Russian player can try to reactivate the tank to get it out of trouble, but will have to roll a 3+ to do so (for a second activation and one morale marker). But the gun would be able to react to that again, so the Russians might be better to instead activate nearby friendlies to try and suppress the Pak-40 and keep it from firing, or possibly force it to fall back. An important nuance is that players must also burn command tokens to rally troops under fire, and either side can do this at any time. Effectively suppressing enemy troops will force the enemy to use some of their command tokens keeping their units in order, which will cut down their ability to activate other parts of their force. Or maybe they’ll accept some units getting a battering in order to preserve tokens for a counter-attack? It’s a simple mechanism that gives rise to interesting decisions for a commander. The turn lasts until both players have spent their tokens. One side has the initiative and can choose what to activate, with the enemy able to react. That initiative can be stolen by lucky rolls on reaction dice, or a player can voluntarily give it up. While this might seem an odd thing to do, it’s always worth having tokens in hand to react with. For example: The Germans have spent all their dice and left the Soviets with several. The Soviet player now has lots of dice to manoeuvre and put tons of fire onto any isolated German units, and they won’t be able to rally off any suppression or fall back. The Germans will just have to sit there and take it. Since units die in Iron Cross when their level of suppression gets too high this is a bad idea. German troops fire masses of panzerfausts at a tank, check out all those command tokens! Troop quality isn’t covered in the basic rules; all troops are identical. It does pop up in some downloadable army lists, and is handled by giving troops more or fewer command tokens. I’m not sure that’s a good way of doing it. The number of command tokens represents the quality of leadership, but it doesn’t simulate the quality of the troops very well. A platoon in a conscript force would be able to fight just as hard as one in an elite force, it’ll just burn a greater share of the formation’s command resources to do so. So small parts of crummy forces can still perform incredibly well, it’s just that the rest of the force will be paralysed. That’s not really how it works in real life. I think a better way of simulating troop quality would be to increase or decrease the number of elements. So an elite platoon might have five elements (and therefore greater firepower and more durability), if you’re using singly based miniatures you could drop the number of men in an element. Vice versa for green troops, where a platoon might only be two elements, each with lots of men. The fact that this kind of basic stuff isn’t in the rulebook, but is in the individual army lists isn’t something I’m a big fan of. The first set of expansion army lists contains no less than twelve new rules. Most of it is stuff that should have been in the main book IMO. Putting it all in the army lists doesn’t reduce the amount of rules in the game, it just spreads them out in lots of places. Infantry move at 9″ (or 6″ if they fire), vehicles are either light, medium or heavy. Softskins and troops transports on a road can move 24″ so having some trucks or halftracks will be useful for attackers, who will generally be coming on from their baseline. Troops can presumably ride on tanks, but there are no particular rules to cover this. Luckily transport is absurdly cheap. Trucks that can carry two 25pt infantry elements only cost 3pts, a half track for a single element is 6pts. Transports can move at 10″ and then debus troops who can move a further 6″, vice versa with mounting up. Most tanks will move 15″ (or 20″ on a road) or 10″ if they want to shoot. Bear in mind that you can activate units multiple times in a turn. It’s not unreasonable to expect small detachments of vehicles to be able to make a road move of 4-6′ in a turn, although you’ll have to throw a lot of command tokens at them and not fail the reactivation tests. 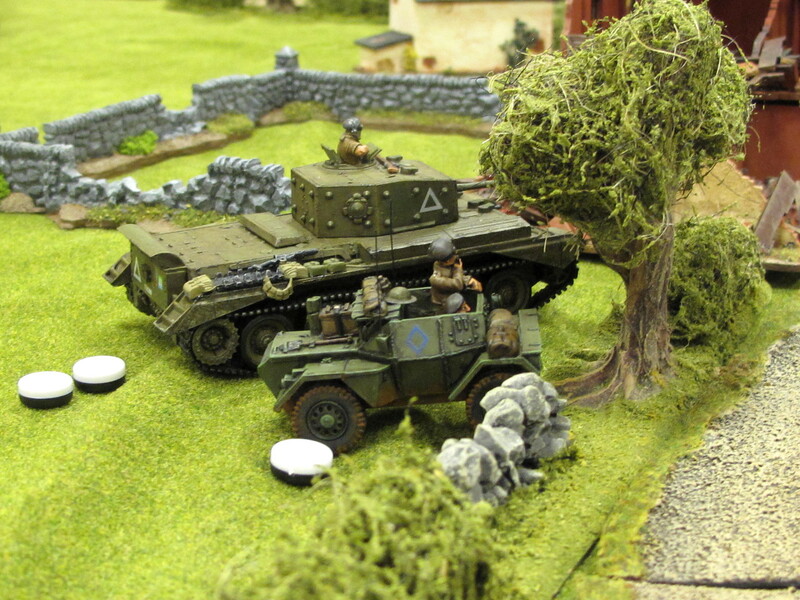 Platoon movement allows groups of three elements to move together for two tokens, but they can only make a normal move (ie: 6″ infantry, 10″ for medium tanks) and can’t reactivate to move again. This is a nice efficient way of slowly bringing up troops that are still out of contact, as the ones that are in contact will be spending more than their fair share of command tokens. There’s almost no fog of war, everything goes on the table. Only in an attack/defend scenario is there any fog, and only on the defending side, who deploy their whole force as markers +50% dummies. This is a major weakness of the rules IMO, especially since the authors state they want the rules to be usable up to battalion level in big games. In meeting engagements both sides will have full situational awareness, which is a bit old-fashioned for a ruleset published in 2015 IMO. To their credit, in the Meeples interview the authors sound pretty unimpressed with meeting engagements as games, and I’m inclined to agree. Despite it’s popularity with wargamers actual meeting engagements in combat are pretty rare. Forces can be kept in reserve but I can’t see any real advantage to doing so, presumably this rule is in there for historical scenarios that need reserves to arrive during the battle. None of the generic scenarios contain any flank marches, your reserves come on from your baseline. Shooting is done on a d10. Most weapons have unlimited range, if you can see it you can shoot it. The basic mechanic is roll a d10 (2d10 against infantry at short range), a 5 is a hit and inflicts a morale marker. You then roll a d6, inflicting a further morale on a 4-6+ depending on the target’s cover. Sounds simple? Well, not really. Unfortunately the authors have made virtually every weapon in the game work slightly differently. Some roll different dice to hit or different ones to damage. They all work slightly differently, and while manageable it does seem odd that they’ve stripped so much else out of the rules, but left a basic mechanic like this in a bit of an untidy mess. One of the first things fans have done on the game’s forum is to produce a QRS that sums all the different dice rolls up. Most weapons have twice the rate of fire against infantry at close range. This includes tanks, which I’m not a fan of. Under Iron Cross it’s completely possible for a tank unit unsupported by infantry to be sent in against an infantry position and the only penalty they’ll suffer is a very small to hit penalty and reduced speed. They’ll be perfectly capable of pushing infantry out of dug in positions through firepower alone. A 6pdr AT gun on the lookout for tanks. Firing at vehicles uses a similar but slightly different mechanic to firing at infantry. One strange quirk of the rules is that (unlike vehicles) infantry do not suffer any penalty for firing on the move, but are harder to hit if they themselves moved. So when engaged in a fight your vehicles are best used sitting still, while your infantry should move continuously. This can lead to the odd situation where defending units shimmy left and right. For hits on vehicles you roll a d10 plus your weapon value and if you exceed the target’s armour you’ve penetrated. A further d6 gives a 50/50 chance of a KO, otherwise it gets more morale markers (remembering that morale markers can force a crew to bail anyway). Cover doesn’t affect vehicles, except when they’re hull down where it reduces the probability of a hit knocking out (somewhat bizarrely instead of affecting your odds of actually being hit). Vehicles can be knocked out with a single shot if it’s powerful enough, which is a major difference from infantry, which can only be worn down by multiple hits inflicting morale markers. There is no close combat, which I’m fine with, but there’s also no particular attention played to fighting in built up areas. Troops in buildings will get cover, but there’s no mention of lines of sight and the rules don’t really simulate infiltration and breaching in any way. You simply sit back and blast the buildings at whatever range you like until the guys in them are dead. And speaking of line of sight, it’s not just built up areas that the rulebook is silent on. It mentions you can shoot anything you can see, you get some benefit from cover, and arcs of fire are in there, but nothing about LOS and terrain is mentioned at all. Can troops beyond a hedge be fired upon? What about troops inside a forest? While terrain rules shouldn’t be too prescriptive I can’t see any particular reason to leave this out. The authors suggest people can (and will have to) house rule something, but if everybody is going to have to house rule it, why not just put something in the actual rules? Medium mortars are covered, they can use indirect fire against a single enemy element in LOS of another friendly element. They’re good against troops in cover, but there’s no beaten zone. They’re pretty poor the first time they’re activated, but get better with each reactivation. This does simulate their high rate of fire well, but also means catching troops in the open isn’t especially deadly. Overall they’re a lot less dangerous than in some other rule sets. Arty is limited to prep bombardments in some scenarios, which can inflict some suppression pre-game. For attacks at company level this is fine, although some defensive arty would be nice, especially as the authors suggest the game can scale up to battalion. A battalion in defence is going to have a defensive fire plan that includes artillery support. There’s no air support, which is a perfectly sensible omission for this period and scale IMO. As mentioned above, morale is built into the command mechanic. Whenever a unit is hit it will take a morale marker reflecting suppression and shock. All units have a morale rating, once they take more morale markers than that they’re dispersed or bail out. Infantry and most tanks can take five, heavy weapons and AT guns can take three. A player can spend a command token to take a “company morale test” at any time. This can remove some or all of the morale tokens on an element. Units can always choose to fall back. This ignores all the suppression on a unit when testing to activate them, so heavily pressed elements are able to give ground fairly easily. This nicely allows commanders to conduct a delaying action, something many other rule sets struggle with. A British infantry platoon enters a village in the Low Countries. A German MG reacts, firing on the lead elements. 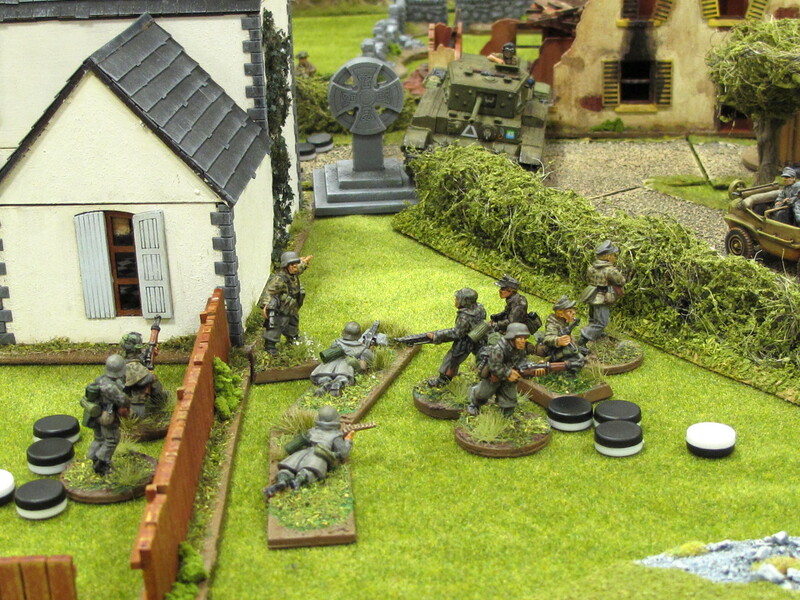 The British troops halt and pour fire on the MG, inflicting three morale markers. The German player would need a 6+ to react and fire again, but only a 4+ to fall back, and also has a 50/50 chance of rallying one of the morale markers when it does. Units which fall back remain vulnerable until they’ve been rallied sufficiently, so it’s important to have fresh friendlies in support. In general Iron Cross rewards a combined arms approach and encourages a player to keep fresh reserves available to commit. There is a kind of force morale. Each unit has a value in “break points”, which is essentially their points value scaled down. As units are destroyed you’ll have to keep track of their BP value, and when your force reaches a defined level they go home. I can see many people skipping this altogether. It’s both too fiddly (you’ll be checking the charts every time a unit is killed and keeping a tally on a piece of paper) and too abstract. There’s no progressive negative effect of falling force morale, the whole force operates at 100% effectiveness then suddenly gives up when the break point is reached. If you reach your break point, it’s game over. Some pretty generic scenarios are included in the book (meeting engagement, attack/defend, etc), in some cases you’ll be trying to take objectives which will mean instant victory and there is a breakthrough scenario which rewards you for getting your force across the table, but generally it’s going to be about inflicting casualties. I think this depends on what you’re trying to use it for. The authors suggest it’s good for everything from platoon to battalion games. Realistically I think it sits best at about a company. Platoon games will only be 3-4 elements per side, so hardly worth laying the table for. At company-plus level you’re talk about 20 elements (probably about 40 infantry figures and 3-6 vehicles). Any bigger than that and the stuff missing from the rules (fog of war, recce, field defences, arty, etc) will start to break your suspension of disbelief. Figure scale is also going to matter. Right now 28mm is popular for games like Bolt Action and Chain of Command, so that’s what many people have. The cost of putting anything more than an infantry company with some tank support on table will rule the bigger games out for most people. 15mm or 20mm is a much more reasonable proposition, especially if you’re an ex-FOW player with tons troops and terrain. The game is too tokeny for 6mm. 15mm is probably the smart choice if you’re starting from scratch. What it sets out to do, Iron Cross does well. For short range engagements between roughly company sized forces of tanks and infantry without any support from other stuff the rules work well and are some places quite elegant. The integration of command, morale and suppression into one mechanic is genius. The rules are simple enough that it can be used for a multiplayer smash up down at the club with people who haven’t played before. I think this is exactly where Iron Cross’s niche is: it’s not quite a beer and pretzels game, but if you want something that is quick to pick up, can handle multiple players, engages both sides of the table at the same time, and provides some interesting tactical play from simple mechanics then give it a go. The core command and control rules are solid, but the authors’ zeal for stripping them to the bone does mean that I don’t feel this has got the depth needed to become your main WW2 game. There are also a lot of weird little quirks that will probably give rise to a lot of house rules. Of course, there’s nothing wrong with that. You might want to take the view that what’s in the book is a foundation on which you’re encouraged to build. This may well be on the cards anyway, the authors have suggested that supplements will be following up, and might go some way to filling some of the bigger gaps. You can see a demo game of the rules in action here. I’m going to bolt on the command to BKCII to see how they work. I’d be interested to hear how that works. What scale do you play in? I think the tokens could get a bit out of hand in the smaller scales.